Companies should be communities of workers and more than mere commodities or machines focused on the pursuit of profit, says Irish management theorist Charles Handy. WHAT DID YOU DO WHEN YOU WEREN'T AT THE OFFICE TODAY? How to get the most out of roundtables, conferences and other knowledge transfer events. Despite being released in 2006, Covering has never been more relevant to the diversity issues facing modern businesses. GC takes a look. Ericsson’s Stockholm-based chief legal officer and head of group legal affairs Nina Macpherson, and corporate counsel Lisa Edblom, describe how and why they designed a human rights-compliant due diligence framework for M&A transactions. Failure to take bribery and corruption seriously can be a costly mistake. 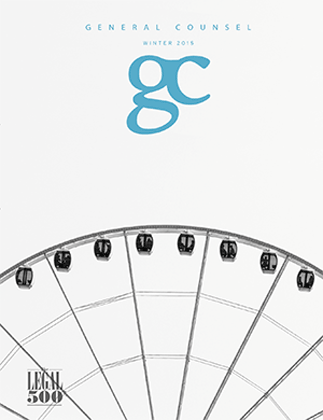 GC looks at methods employed by legal and compliance teams to keep enforcement regimes at bay. An experienced general counsel currently at the legal helm of leading Polish media group , TVN, recently presided over the company’s acquisition by US group Scripps Networks Interactive. So, your business has acquired another business. What now? Peter Wexler is senior vice president and general counsel for the highly acquisitive global energy management company Schneider Electric. In 2013 it bought Invensys for £3.4bn. He talks GC through integrating legal departments, pre-merger strategy and what needs to be actioned post-merger. Given the transactions costs incurred by private equity funds, fund managers and portfolio companies are often leanly staffed - or even not staffed at all - by in-house legal teams. The over-reliance on external counsel can be hugely inefficient. Steve Yoost, general counsel of cloud hosting service HOSTING, argues that in-house counsel can increase the value of private equity investments by effectively managing and mitigating risk. RPC, once a traditional firm known mainly for insurance work, took a sharp left starting in 2008 with a complete overhaul of its business. It now divides its client focus between the still sizeable insurance side and an increasingly broad corporate/commercial offering; the balance is now a rough 50/50 split. With its bountiful natural resources, thirst for projects and burgeoning accessibility to foreign investors, the Middle East continues to play a major role in the world economy. GC talks to heads of legal across the region about its challenges and opportunities.